International Readers, The Girl He Used to Know Is Coming Your Way! 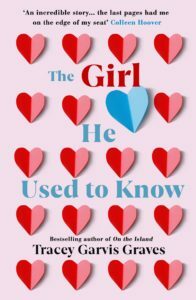 I really love this flirty, gorgeous cover of the UK edition of The Girl He Used to Know. The ebook, audio, and trade paperback of The Girl He Used to Know will be available in the UK (ebook and audiobook only), Australia, New Zealand, India, and Ireland on April 4th. The UK trade paperback will follow on August 8th, 2019. Click HERE to pre-order your copy today! Would you like to listen to a clip of the audiobook? Click HERE. If you like what you hear, click HERE to purchase the audiobook. Also, foreign rights for The Girl He Used to Know have been sold in the following countries: Israel, Czechoslovakia, Italy, Germany, Serbia, Croatia, Bulgaria, Romania, and Poland. I don’t have publication dates yet, but I’ll pass them along when I do. previous post: The Ebook Of On The Island Is On Sale Today! next post: The Girl He Used To Know Is Available Now!